LEWISTON, Mich. -- Just a few miles down the road from the tiny blink-and-you'll-miss-it village of Lewiston, is a golf resort that's been doing things its own way since it opened more than 50 years ago. Garland Resort is the kind of place where golf and relaxation are on the mind 24/7. Garland Resort is home to the classic golf retreat, founded in 1951 by the Otto family, which still owns the facility today. Garland's vibe remains undoubtedly old-school, from the service to each of the four golf courses — built before big-name architects were all the rave in the northern Michigan and big land-shaping tools were used to carve dramatic visuals. What's interesting to note about Garland is that it took a disaster to make the resort what it is today. For the first 34 years, Garland grew from a nine-hole resort to 36 holes. Then in 1985, a gas explosion and fire destroyed the original clubhouse. That's when Ron Otto, son of Herman Otto, decided to take action on his vision to make Garland an ultimate four-seasons retreat, creating four new 18-hole golf courses over the next several years. Garland prides itself on being an all-inclusive golf retreat, the kind of place where golf and relaxation are on the mind 24/7. Part of offering a little bit of everything on site is based on sheer necessity. There isn't much around Garland, aside from a small town a few miles down the road. One of the most convenient things about the courses at Garland is its proximity. Right outside your patio or balcony is a driving range, practice greens, bag room and the No. 1 tees to each course. 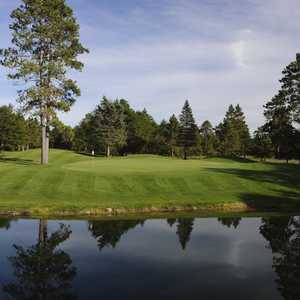 There's no need to drive to a separate facility or take a 10-minute cart ride to the other side of the course like many other northern Michigan resorts. Service also stands out. There seems to be a go-out-of-our-way approach at Garland from just about every position. Newcomers to the resort are made welcome very quickly and the staff escorts you right to your room and answers any questions necessary. They also pick up your golf bag and deliver it to the bag room immediately and it's ready to go in the morning. One night, after playing 54 holes in one day, we were relaxing in one of the resort's spas, when a night watchman walked by and asked us if we wanted anything from the bar, which was a few hundred yards away. The designer of Garland's 72 holes is a virtual unknown to most of the golfing world. Ron Otto, who is also the resort's owner, had no designs to his credit before taking on the multi-course Garland project. The result is a course that doesn't necessarily follow all the rules of golf design. Otto is a fan of par-3 finishing holes and five or six par 3s and par 5s on each course. Only the Monarch Course has the traditional format of 10 par 4s, four par 3s and four par 5s. It's also the only course that plays more than 7,000 yards (7,166) and features the highest course rating at 75.3. None of the four courses are back-breakers by any means, which is another reason why Garland is a favorite for corporate retreats, which feature many players who haven't played since, well, their last retreat. However, enough difficult shots exist for the better player to keep things interesting. Garland Resort's Swampfire Course has water everywhere and the par 4s on the Monarch's backside are all more than 420 yards from the back tees. The greens on the Fountains Course are the most difficult of the four, featuring large and often multi-tiered greens. The elevated par-3 11th is 52 yards deep and worth looks from about every angle, or else your putt is likely to roll right off if not careful. 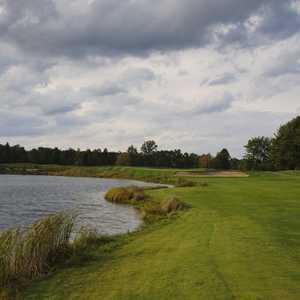 Swampfire resembles a heavily wooded Myrtle Beach or Florida course over a northern Michigan course. Water comes into play on 16 holes and the land is flat. Reflections, at just 6,400 yards, is the easiest of the four courses. Garland Resort's strengths come in its all-inclusiveness. Everything you need at the resort is at your doorstep, including the first tees of all four courses. The service at the hotel and club are also a cut above anywhere else in northern Michigan. As a designer, Ron Otto pushes the envelope, with 6-6-6 par-3, par-4 and par-5 designs and par-3 finishers. The Monarch is the longest and most difficult of the four and also has the traditional amount of par 3s and par 5s. Swampfire has enough water to liken itself to a Myrtle Beach or Florida course and the Fountains features the biggest, trickiest greens. The Reflection Course is the easiest, shortest (and cheapest) of them all. Despite only one designer, redundancy shouldn't be a problem for anyone, as each is defined by something different. There isn't much in Lewiston and the area surrounding Garland, but you shouldn't have much reason to leave until checkout. Garland has several lodging accommodations, from the traditional lodge which features single rooms with patios and balconies overlooking the courses. You can also choose from golf cottages that house up to six people and are located on the Fountains course, as well as on-site villas and condos. Hildegard's Dining Room is a hunting-themed dining room and is the main option at the resort and features a variety of fish including their local specialty: Great Lakes Perch. Herman's Grill is a more informal option and good for a quick lunch and features live music on many nights. The Tiki Bar is located outside one patio and has a fantastic happy hour with discounted drinks and delicious cheap hot wings.